Your sinuses are chambers in your skull around your nose and eyes. They are filled with air. Sinusitis is an infection of these chambers, which causes them to become swollen or inflamed. Many cases of sinusitis clear up on their own. Most of the time, you DO NOT need antibiotics if your sinusitis lasts for less than 2 weeks. Even when you do use antibiotics, they may only slightly reduce the time you are sick. Your health care provider is more likely to prescribe antibiotics if your sinusitis lasts longer than 2 weeks or recurs often. Your provider may also refer you to an ear, nose, and throat doctor or an allergy specialist. Inhale steam 2 to 4 times a day. One way to do this is to sit in the bathroom with the shower running. DO NOT inhale hot steam. Use a humidifier to keep the air in your room moist. You can buy nasal sprays that relieve stuffiness or congestion without a prescription. They may help at first, but using them for more than 3 to 5 days can cause your symptoms to get worse. Allergies that are not well-controlled can make sinus infections harder to treat. Antihistamines and nasal corticosteroid sprays are 2 types of medicine that work well for allergy symptoms. A nasal corticosteroid spray is a medicine to help make breathing through the nose easier. You can do many things to limit your exposure to triggers, things that make your allergies worse. Control molds, indoors and out. Avoid exposure to plant pollens and animals that trigger your symptoms. Take all of the pills as prescribed, even if you feel better before you finish them. Always dispose of any unused antibiotic pills you may have at home. Reduce stress and get enough sleep. Not getting enough sleep makes you more likely to get sick. Wash your hands often, such as after shaking other people's hands. Your symptoms last longer than 10 to 14 days. You have a severe headache that does not get better when you use pain medicine. You have any changes in your vision. You notice small growths in your nose. DeMuri GP, Wald ER. Sinusitis. In: Bennett JE, Dolin R, Blaser MJ, eds. Mandell, Douglas, and Bennett's Principles and Practice of Infectious Diseases, Update Edition. 8th ed. Philadelphia, PA: Elsevier Saunders; 2015:chap 63. 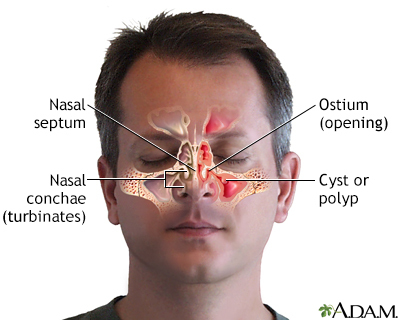 The sinuses are surrounded by bone and cartilage and lined with a mucous membrane. Sinusitis occurs when the membranes becomes inflammed and painful, which may be a result of a blocked sinus opening. Chronic sinusitis is often caused by inflammation and blockage due to physical obstruction such as a deviated septum, misformed bone or cartilage structures such as the nasal conchae (turbinates), or blockage by nasal cysts or polyps.